Leading London developer Galliard Group has completed its 3.5-year construction of the new Great Scotland Yard Hotel. The building was the location of the original Scotland Yard Metropolitan Police HQ and later offices for the Ministry of Defence. Today it is London’s magnificent new 93,000 sqft 5-star hotel, owned by the Lulu Group International and operated by Hyatt. 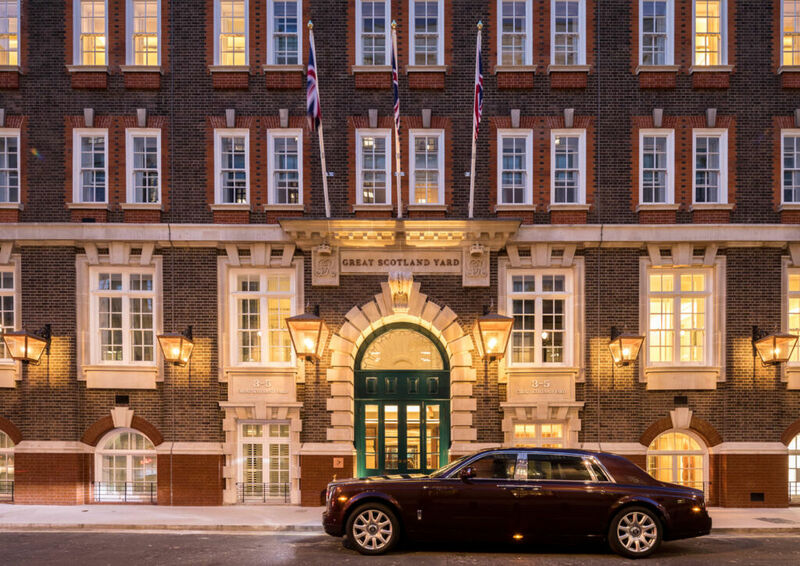 In 2013 Galliard Group acquired a 125-year Crown Estate lease on the building which was exchanged for a forward sale of the hotel when completed to Abu Dhabi based LuLu Group International in 2016 for £110 million. Galliard’s construction division has now completed the £75 million construction project to deliver the new hotel, working with world-renowned hospitality design firm Hirsch Bedner Associates. One of the finest 5-star hotels ever built in London, set to launch later this year, the new £110 million seven-storey hotel at 1-5 Great Scotland Yard provides 153 bedrooms and suites; the 11 suites including a spectacular townhouse suite created from part of the original Scotland Yard Police premises. 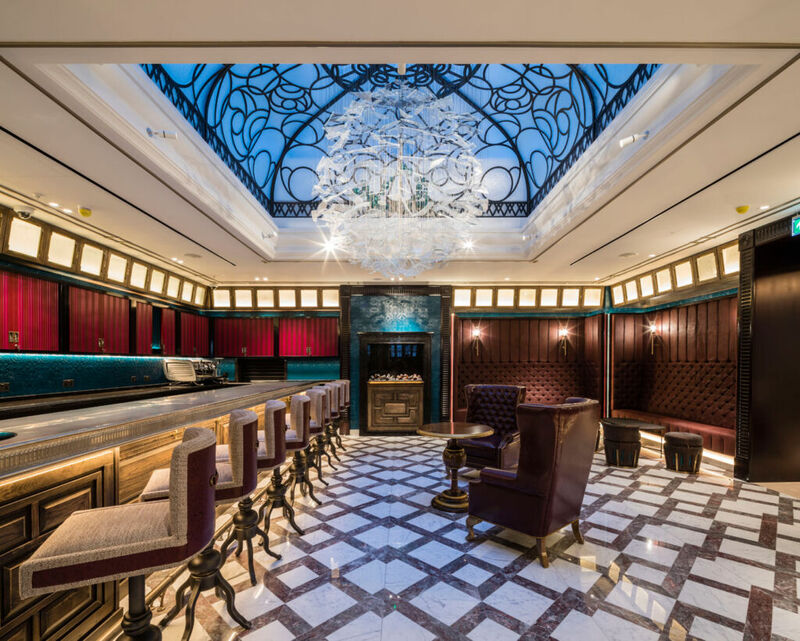 Hotel features include interior design references to the building’s police and military past through the use of shields, emblems and historic details etched into glass and metalwork. The hotel has a double-height vestibule, grand entrance lounge, concierge, main cocktail bar, palm court style lounge, whiskey bar/clubroom, signature restaurant, library, gymnasium, 120 seater main conference room/ballroom, meeting rooms and function/private dining rooms. Over the last 10 years, Galliard Group has built 10 hotels providing 2,061 bedrooms and suites and a range of hospitality and leisure amenities. Working with a range of clients, past hotel projects include new build and refurbishment schemes including the 5-star St James’s Club & Hotel, Staycity Hotels, Premier Inn, 4-star Park Plaza Hotels and the Grade II-Listed Jacobean Harte & Garter Hotel and Spa. To deliver the Great Scotland Yard Hotel the construction division of Galliard Group, led by CEO Don O Sullivan and MD Robin Hawkins, project managed a team including Head of Galliard Design Lesley Lawson and Galliard Construction Director Darren Maguire, working alongside professional consultants and an international team on site of up to 200 people, from 18 different countries. Galliard was responsible for construction and build, shell and core design, fit out, specification procurement, logistics and M&E. Delivery required Galliard to liaise with a range of stakeholders including Westminster Council, The Crown Estate, TFL, BT, MOLA and Westminster Highways. In 1901, the townhouse at 1 Great Scotland Yard was leased to the armed forces and this saved it from demolition in 1910 when the other townhouses and adjacent gardens were replaced by the current Edwardian building at 3-5 Great Scotland Yard which served as the British Army Recruitment Office and Royal Military Police headquarters. It was from this HQ that Lord Kitchener famously told WWI recruits “Your Country Needs You” and there were cells in the basement for Army deserters. In 1982 a refurbishment introduced a new atrium and the building later became the Ministry of Defence Library until 2004. To deliver the outstanding specification Galliard has sourced over 200 different custom-made materials, fixtures and fittings from locations including Italy, Vietnam, China, Japan and Turkey using the finest finishes including different marbles, stone, crystal, wood and leathers. 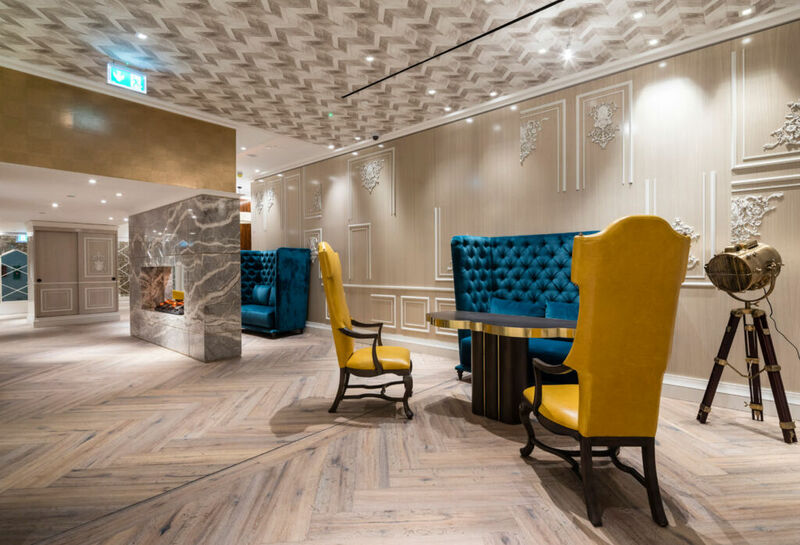 Artisans from six different countries were sourced to create many of the handcrafted special finishes including wall panelling, bespoke flooring and ceiling mouldings. Double doors at the hotel entrance lead into a vestibule with an 8-metre (26 ft) high ceiling and feature chandelier by Precioisa, which opens onto the main reception foyer which has Italian Crema marble flooring in a bespoke marquetry design created from different coloured marbles and custom-design plasterwork ceiling with cornices and ceiling roses created by artisans. In keeping with the building’s heritage, the walls are lined in walnut panelling, antique bronze mirrorwork and bespoke joinery. Located behind faux book doors in the main foyer, the whiskey bar/clubroom has timber marquetry flooring crafted by artisans from Italy, timber-panelled walls and plasterwork ceiling. The bar is created from natural three trunks and the room is complete with bespoke display cases for whiskey and other drinks. 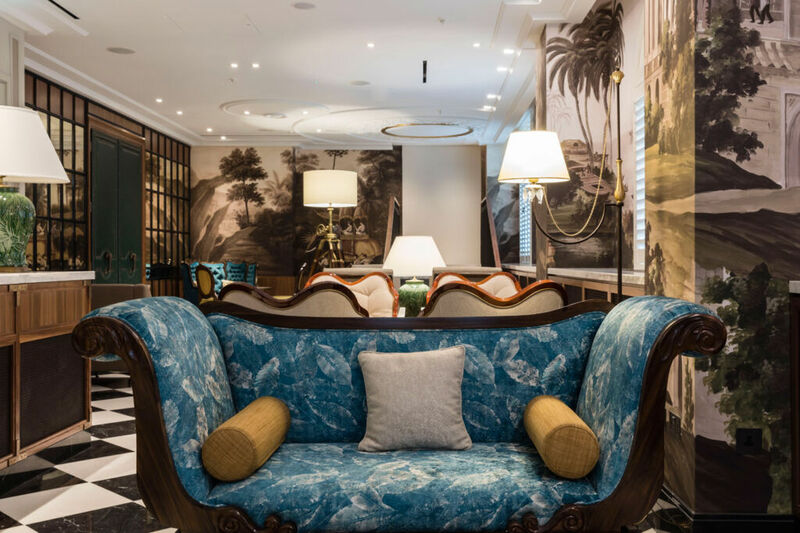 Another lounge is designed in the style of a Victorian palm court with Indian inspired wallcovering and ironmongery, complete with feature fireplace and ceiling designs. On the lower ground floor/basement 1 the cells, where legend has it Rudolf Hess was interrogated in 1941, have been replaced by a gymnasium with changing rooms, meeting/conference rooms, a 120-seater conference space/ballroom and a series of VIP function rooms. The function spaces have been designed to replicate the interiors of a grand London townhouse with bespoke Oak parquet flooring, chevron patterned ceiling, marble fireplace, kitchen/serving area with Union Jack Smeg fridges and library area with bespoke joinery. Basement 2 contains back of house facilities including plant, kitchens, staff offices and leisure area. 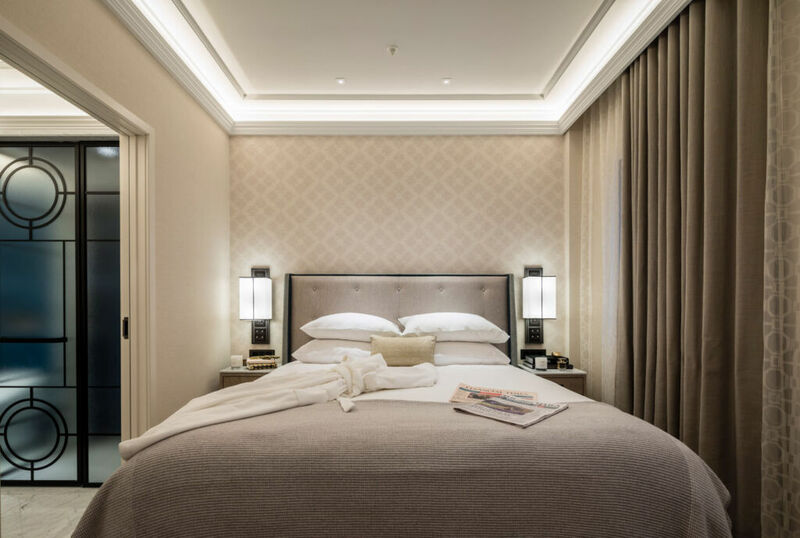 With concept designs from Hirsch Bedner Associates, two hotel bedrooms were initially mocked-up on site by Galliard, allowing for the creation of beautifully designed and finished bedrooms and suites on the upper floors of the hotel. The hotel bedrooms have ornate coffered ceilings, bespoke fitted wardrobes, mini-bar units and mirrorwork; and luxurious bathrooms with marble flooring, walk-in showers and bespoke vanity units. The suites have an ante room, living area, bedroom suite with feature stone fireplace and VIP bathrooms, with selected suites benefitting from private terraces offering views onto Nelson’s Column, Buckingham Palace and Westminster.